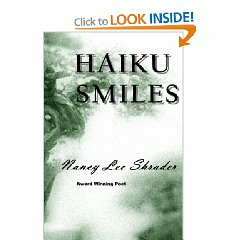 My name is Nancy Lee Shrader and I'm the author of four books, "IS IT NOW? The End of Days! ", "IS HE MESSIAH? Messianic Prophecies Revealed! ", "The Curse of Mayweather House" and "Haiku Smiles"
Many of us enjoy Ghost Stories that frighten us and send us screaming into the night. The Curse of Mayweather House might be a Ghost Story, but love blooms brightly in the hearts of the undead — a love that has lasted over a century and will live on through eternity. Leora Grace and Captain William Thomas Mayweather have searched the underworld of the dead, hoping they would rediscover loves burning flame, that death’s sting could not extinguish. Demons lurk in the bowels of Mayweather House, enticing its victims into its dark maze of evil. This Evil has stalked Nancy Lee Abernathy her entire life, in an attempt to stop her from freeing the Mayweathers from the curse. With the aid of William and Leora Grace, Nancy Lee is spared the death that the demon planned for her on the day of her birth and all the other times during her life. Nancy Lee, in turn will aid the ghosts in their quest for freedom. You will discover adventures, suspense, mystery and drama all in “The Curse of Mayweather House” which is also a ghost story, as well as a love story. Nancy Lee Shrader has something for everyone in this story of Leora Grace and Captain William Mayweather, whose deep love endures following their death. The search for a way to end the curse, save future victims from it, and for Leora Grace and Captain Mayweather to be reunited for eternity will keep you reading anxiously, not knowing what to expect from the next page turn. A lengthy, discriptive prologue full of a rather sinister history begins this tale. It provides a background for the location, and introduces the narrator, (who haunts the property.) The action in this story takes place in and around "Mayweather House,' a house built above Devil's Bluff near Southhampton, England. The prologue is slow, but intriguing... and not entirely necessary. In this twist on the classic haunting, the ghosts of Mayweather House must eventually reach out to the living, in a desperate effort to find freedom from their curse. The ghosts of Leora Grace and Captain William Mayweather cannot find one another, yet cannot escape the house; theirs is a double curse. The living person they reach, Nancy Lee Abernathy, is an amazing character that one immediately admires; determined, terrified, self-reliant, but also with some idea of what lay "behind the veil." She can sense a 'presence' from the first. She is not the 'classic' heroine type though, as she is not the beautiful young heroine, but an elderly, sad person who recognizes the burden of tragedy she carries. She is also reverent and respectful, and engages readers' sympathies immediately. Her one interest; she is intrigued by a puzzle, and involved with the supernatural. Through her, we hear the voice of long-dead Leora, and through her, we share the pain of separation and loss. William and Leora may seem like the main characters in this tale, but in truth, this tale captures the lives of a number of characters, and all are important. There are fast moments here, action, as well as thrilling parts. On the whole however, this is a slow, thoughtful read, full of very good descriptions, insights, and emotions. The style seems old-fashioned, where words are meant to be savored and all the deeper meanings of events are meant to be understood. This is a book for those who like a good ghost story, and who will slow down to enjoy a certain rich, descriptive quality in a work. This reader had difficulty assigning a number to this work as I don't imagine this will have broad appeal, but am giving it 4 books for its wonderful writing quality and great depth of story. Shrader's "The Curse of Mayweather House," is wonderfully original, intriguing and evocative. This is a very Gothic kind of story, rich with descriptions of the past and present lives involving main characters Leora Grace Stonewick Mayweather and William Mayweather, and Nancy Lee Abernathy. The Mayweather couple are cursed by a captive slave kept a prisoner in a dark room. No matter how much in love William and Leora Grace are, the forces of evil, pure evil, are determined to prevent any kind of happy-ever-after. The story ping-pongs back and forth to the days that Leora Grace and William Mayweather lived in England to the present day where the sympathetic observer, Nancy Lee Abernathy, seems totally consumed in their lives and involved with their ghostly presence, as she is transported back in time to observe the tragedy, the joy, and the struggles Leora Grace and William have. Had the dashing sea Captain William known of a horrible curse, he surely wouldn’t have built a house of love for his beloved there. This is a tragic tale filled with ghostly images and sinister demons wreaking sheer hell and havoc over all of it. If you love mystery and darkness and the Gothic genre, you will love Mayweather House. It was enjoyable. THE CURSE OF MAYWEATHER HOUSE is a wonderfully conceived and written ghost story that will keep you fascinated, not only with the storyline as it winds through the centuries when Lady Nancy Lee Abernathy is given the gift of remembrance, but also of frightening memories from a ghostly past and her own loves and losses. The descriptions of all the characters, scenes and thoughts of each person in the process are described with originality and freshness, thanks to a this accomplished author. dark, starless nights. Many locals have reported hearing this beating as it breathes its venomous curse, causing insanity to fill the minds of many who walk too close to the veil. Two young lovers, Captain William Thomas Mayweather and Leora Grace Stonewick walk blindly into the curse when William's wedding gift, Mayweather House, is constructed on the land. Their life, love and even shorter marriage ends when their eyes are closed in death, yet it is only for a short moment when their hearts ceased to beat. Their great love could not be extinguished, even by death, so for one hundred and thirty odd years William and Leora Grace Mayweather search the underworld of the dead for the love that was stronger than any curse. In their search they enlist other young lovers to join them in changing the destinies of those future victims entrapped by the beauty and lure of Mayweather House. Read how the destinies of Justin, Michael and Lyndsey Alistair were laid out years before their births and each haunting led them to Mayweather House and the end of the curse. William and Leora Grace will lead them until the curse is finally broken and love blooms again for the star-crossed lovers of Mayweather House. Nancy Lee Shrader's word pictures of the Mayweather mansion, its inhabitants and their lives are incomparable. Leora Grace Mayweather was to be the one and only mistress to the Mayweather House. She had fallen in love and eventually married Captain William Thomas Mayweather. However their love was cut short when she perished on their honeymoon voyage aboard the Leora. Captain William Thomas Mayweather had commissioned the Mayweather House to be built for his lovely bride. The house was to be one of the most magnificent homes in all of England. Upon the death of his wife the Captain was so distraught that he himself died of despair not long after. Nancy Lee Abernathy had experienced many adventures in her long life. The curse of the Mayweather House had drawn her and her friends like it had many others over the years. With the help of her guardian angel she escaped with her life and her sanity, but others were not so lucky. But she was ready to be reunited with her late husband and son. Roaming the mists of the afterlife the ghosts of Leora Grace and Captain Mayweather searched for each other for over a hundred years. They knew that to end the curse of the Mayweather House they would have to enlist the help of Nancy Lee Abernathy and several other people in the living world. The curse had been put upon the Hunley land long before the Mayweather House had been built. A young slave girl that had been tortured by the Hunley’s cursed the land and those that owned it for all eternity. Centuries later during the building of the Mayweather House, the curse took on a new twist with the evil Tommy Ray Hussyman vowing to kill Leora Grace and Captain Mayweather. He was so enraged when Leora Grace chose the captain over him that he vowed to never let anyone have her if he could not. So for the next one hundred plus years the star crossed lovers tried to find their way back to each other through the fog of the dead. The ghosts of Leora Grace and Captain Mayweather along with several others fought against the evil spirits to bring an end to the curse. They knew that the time had come and they had to work quickly before they lost their only chance of being together forever. This is a timeless story of love and tragedy. Nancy Lee was a force of nature. Being elderly did not stop her from loving and living with all of her heart. Leora Grace was blessed by the hand of God and loved without measure. Even after her death she continued to have faith that someday she would be reunited with her William. Captain Mayweather was strong and true to his vows. He searched endlessly for his wife whom he would love for all eternity. The ghosts of Leora Grace and William unknowingly came together and told their story through the voice of Nancy Lee, hoping that someday the fogs would lift and they would be together once again. The battle of good and evil continues to wage as this story unfolds and the devils’ day is coming to an end. With faith in God we must believe or be forever lost in darkness. IS HE MESSIAH? Messianic Prophecies Revealed! IS IT NOW? The End of Days!